Kaitlyn finishes her Matdogs career on the medal stand at State! There were Matdogs competing at three different qualifier sites on Sat. March 16th. 14 at Bay Port, 2 at Lakeland and 3 at Waunakee. 5 Matdogs were able to make it to State. 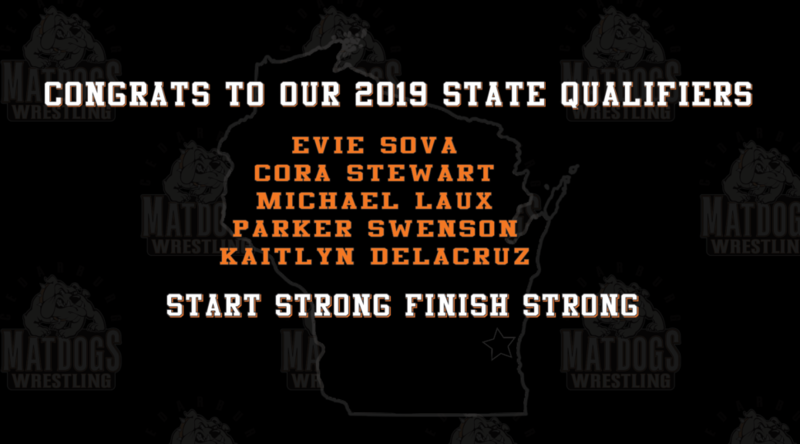 Congrats to Parker, Evie, Michael, Cora and Kaitlyn and Good Luck at State next weekend! The Matdogs had 18 wrestlers compete at the Dominate in the Dells tournament plus 4 more former Matdogs at the high school level. 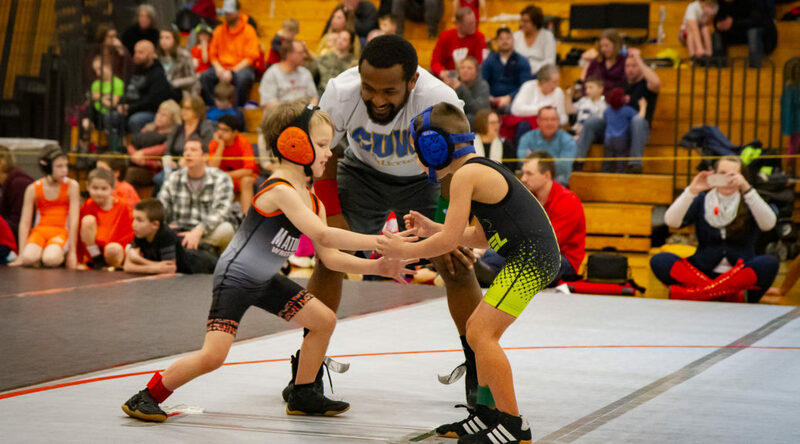 This year there was a True Beginners category added that gave some inexperienced wrestlers a chance to participate in a national level tournament. Also new this year was a Girls division. Congrats to the rest of the Matdogs Adrian, Ollie, Michael, Parker, William, Keegan, Evan, Wyatt, and Louis for competing. It’s a tough tournament with many competing in 16 man brackets and higher. Some Matdogs did not go to the Dells, but still got in some wrestling. Adam Jr. and Owen M. went to Sheboygan Falls, placing 5th and 3rd respectively. Beau and Aaron went to Reedsville placing 1st and 3rd respectively. Unfortunately, the Nicolet tournament was canceled. However, there were Matdogs wrestling at multiple tournaments this past weekend. Landen was in Chilton on Saturday at the Mike Field Youth Tournament and placed 2nd. Sunday there was a big group at Kewaskum. 3rd place: Adam Jr., Joseph, Beau, Bohdan, Austin, Owen B., Owen M.
Also wrestling on Sunday in Kiel was Keegan. 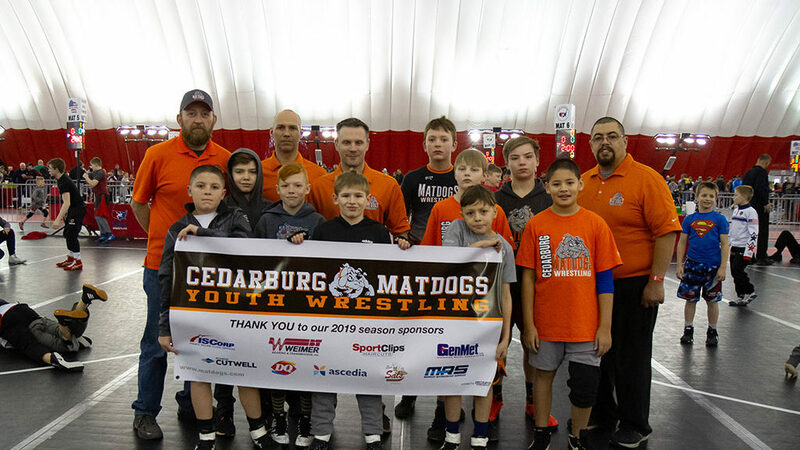 There were 24 Matdogs at the Slinger Red Rhino Tournament on Sunday 2/17/19. Two sessions of wrestling, great wrestling by all. Thanks coaches, family and fans for your support. 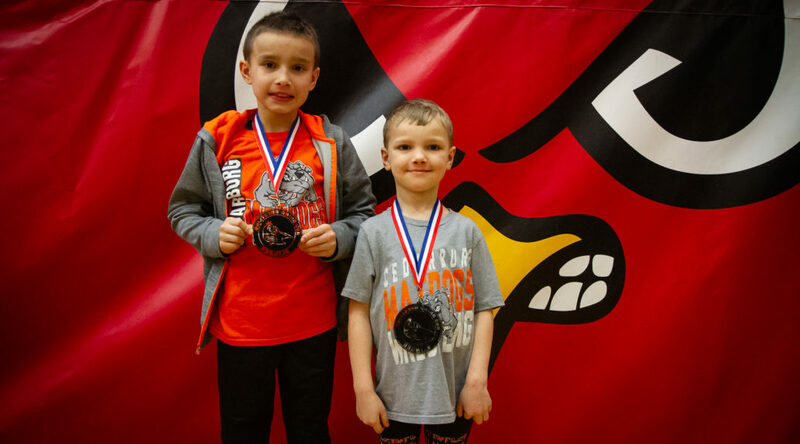 The 2019 Grant Schoen Beginners Tournament, held on Sunday, Feb. 10th, was a great success. We were able to honor the memory of Grant Schoen and raise awareness for HeartSafe Wisconsin. At the same time, we gave 235 beginner wrestlers a chance to experience live wrestling in a tournament, some for the first time. Once wrestlers completed wrestling for the day, they received a finisher’s wristband and an ice cream treat, from Cedar Crest. for event photos click here. There are many, many people to thank. First, thanks goes out to Tammy and Jeff Schoen for sharing their story and helping educate people on how to be “HeartSafe”. Thanks also goes to all the Matdog, CHS and CUW Wrestling Teams and coaching staff for providing refs and score table workers. Thank you to all the experienced Matdogs and their family members (past and present) that showed up to support our 33 Matdog beginners that wrestled. Not only for showing up, but were flexible and pitched in where needed, whether it be table workers, towel throwers, bracket hangers, concession workers or being part of the set-up/clean-up crew. It takes many people to make this work and you helped make this event a success. A special thanks to Jason Ipsarides, a coach at Askren Wrestling Academy, for coming out and running a warm-up clinic with the wrestlers. Of course, thanks goes out to all the wrestlers and their families for coming out and supporting the sport of wrestling! Thank you to the 2019 Grant Schoen Beginners Tournament sponsors for their generous donations and support: Aurora Medical Center Grafton Medical Staff, Master Printwear, Cedar Crest Ice Cream, Defense Soap, Olsen’s Piggly Wiggly, Firehouse Subs, Sal’s Pizza and Mike and Laura Boerner. Weimer Bearing & Transmission, Inc., Gen-Met, Midwest Refrigerated Services, SportClips of Mequon, Sharon Cutwell, Ascedia, ISCorp, DQ and Sal’s. 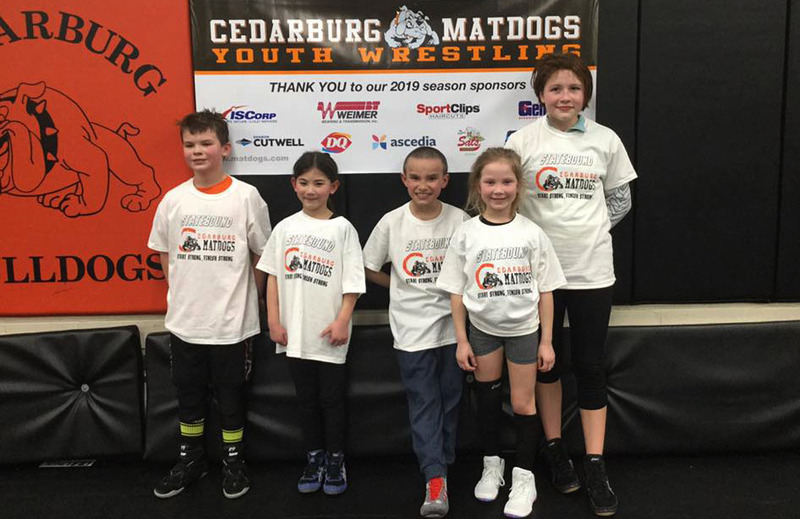 There were 21 Matdogs at the Pewaukee Classic Youth Tournament on Sunday 2/3/19. First place champions took home a pirate bobble head trophy. 2nd place: Alden, Dominic, Cael, Landen, Bailey, Evan, Owen M.
Olympic gold medalist, Ben Peterson, came to practice Monday night (2/4/19) and shared his wrestling experience and knowledge with the Matdogs. 1st place champions: Adam, Parker, Bohdan, Wyatt, Noah, Owen B. and Owen M.